Fungi - Fungi are organisms that obtain their energy from other organisms, living or dead, have a vegetative body made up of microscopic cells that may exist as individuals, but usually are joined to form long tube-like filaments, or strands called a mycelium, reproduce by asexual of sexual spores, have well defined nuclei, and are usually classified as plants but some scientist give them a position of their own between plants and animals. Fungi do not manufacture their own food. They have no chlorophyll. Fungi include the yeast, molds, smuts, rusts, mushrooms, and many forms that do not have common names. There are over 4000 genera and 50,000 species known. Fungi have chitin in their boundary walls. Fungi absorb from the outside inward. Our guts absorb from the inside outward. People who think all fungi are bad should go without wine, cheese and bread for starters. The fungi play a key major role in recycling essential elements from dead organic matter. The fungi often do this in association with many other organisms in the soil: bacteria, insects, worms, amoebae, nematodes, and small animals. 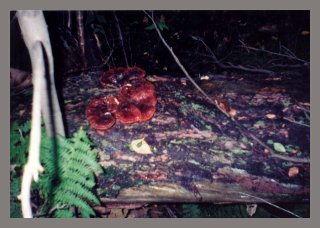 (See the brilliantly colored minute mushrooms that were fruit bodies of a fungus recycling elements in a symplastless log (See TREE ANATOMY, SHIGO, 1994, pg86). Many of the fungi associated with mycorrhizae have mushroom fruit bodies. Others have a variety of fruit bodies above ground and below ground. The major point is that the members of the natural system are all connected. When the connections begin to be broken, the system will suffer. You can kill soil. You can kill a forest. You can kill many living things that depend on a healthy forest. How? By breaking connections. Glyphosate kills by disrupting the shikimic acid pathway in plants. Fungi also have the same pathway (sorry). Mycorrhizae form when some fungi infect young, emerging non-woody roots. The mycorrhizae are organs made up of tree and fungus tissues, i.e., a composite structure. The organs facilitate the absorption of phosphates, manganese, copper, and zinc. Hyphae of the fungus associated with a mycorrhiza often grow out beyond the mycorrhiza into the soil. In a living tree, decay will be surrounded by a boundary, that yields bacteria and nonhymenomycetous fungi. Also see of terms listed for fungi.